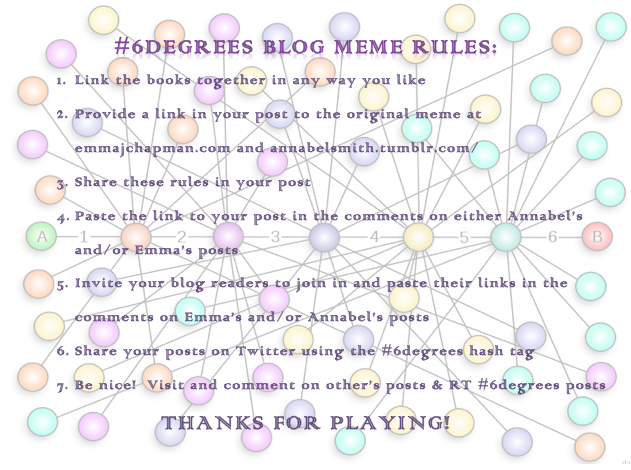 Six Degrees of Separation is a fabulous meme which started last month! I loved doing it then and think this month's has been even more fun - huge thanks to Annabel Smith and Emma J Chapman for coming up with the idea. Head over to one of their blogs and leave a link in the comments if you take part, please! The Bell Jar by Sylvia Plath is a New York-set story about a teen girl, as is Gossip Girl by Cecily von Ziegesar. Gossip Girl was famously released with a 'parental advisory' warning on the cover, which probably did more to attract teenagers than to warn their parents. It lives up to that branding, being full of strong language, but is an awesome read, as is Lobsters by Tom Ellen and Lucy Ivison, the story of two teens trying to lose their virginity before university. Tom and Lucy are doing an interview over at Cheezyfeet Books in a few weeks as part of my Countdown to 5th June event, which kicked off yesterday at The Bookbag, where I interviewed Keris Stainton, author of the totally adorable Starring Kitty. Starring Kitty is an LGBT romance which I absolutely loved, as is Molly Beth Griffin's Silhouette of a Sparrow. And I bought Silhouette of a Sparrow in Foyles, where I'm headed shortly (honestly - I've been saying that for about 90 minutes but keep getting distracted; this time I mean it!) where the brilliant Kate has informed me there's a copy of Melina Marchetta's Jellicoe Road in stock. I'm planning on treating myself to celebrate the end of a busy week, after fellow Dance Academy fanatic (as in, possibly the only person MORE obsessed than I am...) Cait described it last night as "life-alteringly good." Care to share your six degrees? Would love to read them! These are great choices :) Here is my list, I somehow ended up revisiting a ton of childhood favourites. I love this meme! I think Sylvia Plath would be turning in her grave to be linked to the racy Gossip Girl! I hear many great things about Jellicoe Road - I hope you enjoy it.